The Sopwith 5F.1 Dolphin was a British fighter aircraft manufactured by the Sopwith Aviation Company. It was used by the Royal Flying Corps and its successor, the Royal Air Force, during the First World War. The Dolphin entered service on the Western Front in early 1918 and proved to be a formidable fighter. The aircraft was not retained in the postwar inventory, however, and was retired shortly after the war. 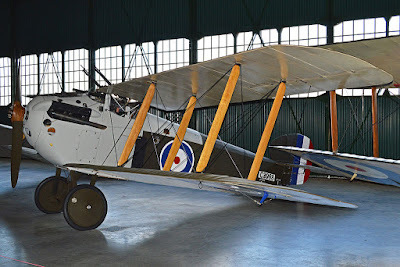 In early 1917, Sopwith's chief engineer Herbert Smith began designing a new fighter (internal Sopwith designation 5F.1) powered by the geared 200 hp Hispano-Suiza 8B. The resulting Dolphin was a two-bay, single-seat biplane. The upper wings were attached to an open steel cabane frame above the cockpit. To maintain the correct centre of gravity, the lower wings were positioned 13 inches forward of the upper wings, creating the Dolphin’s distinctive negative wing stagger. The pilot sat with his head raised through the frame, where he had an excellent field of view. This configuration sometimes caused difficulty for novice pilots, who found it difficult to keep the aircraft pointed at the horizon because the nose was not visible from the cockpit. 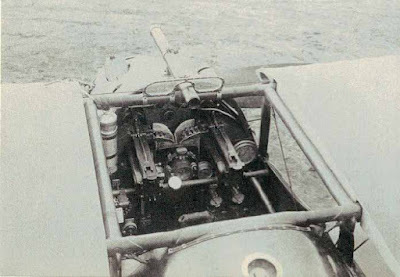 The cockpit was nevertheless warm and comfortable, in part because pipes ran alongside the cockpit walls to the two side-mounted radiator blocks. Shutters in front of each radiator core allowed control of engine temperature. Bombs: Four x 12,5 kg bomb. The first Dolphin prototype was powered by a geared 150 hp Hispano-Suiza 8 and featured a deep "car-type" frontal radiator. 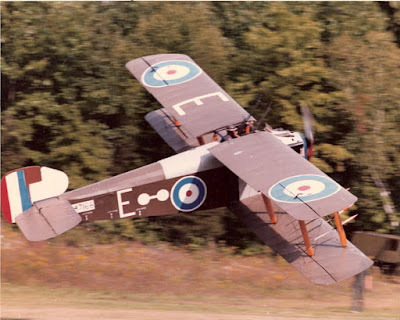 Test pilot Harry Hawker carried out the maiden flight on 23 May 1917. In early June, the prototype was sent to Martlesham Heath for official trials. On 13 June, the prototype flew to Saint-Omer, France, where the aircraft's unfamiliar shape prompted Allied anti-aircraft gunners to fire on it. Several pilots, including Billy Bishop of No. 60 Squadron, evaluated the prototype and reported favorably on it. On 28 June 1917, the Ministry of Munitions ordered 200 Dolphins from Hooper & Co. Shortly thereafter, the Ministry ordered a further 500 aircraft from Sopwith and 200 aircraft from Darracq Motor Engineering Co. The second prototype introduced upper wing radiators in lieu of the frontal radiator and large cut-outs in the lower wing roots to improve the pilot's downward vision. These features proved unsuccessful and were omitted from subsequent aircraft. The third and fourth prototypes incorporated numerous modifications to the radiator, upper fuselage decking, fin and rudder. The fourth prototype was selected as the production standard. Series production commenced in October 1917, with 121 Dolphins delivered by the end of the year. The Dolphin Mk I became operational with Nos. 19 and 79 Squadrons in February 1918. Nos. 87 and 23 Squadrons followed in March. 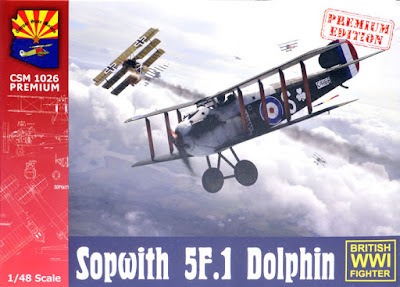 The Dolphin’s debut was marred by several incidents in which British and Belgian pilots attacked the new aircraft, mistaking it for a German type. For the next few weeks, Dolphin pilots accordingly exercised caution near other Allied aircraft. New pilots also voiced concern over the Dolphin’s wing arrangement, fearing serious injury to the head and neck in the event of a crash. 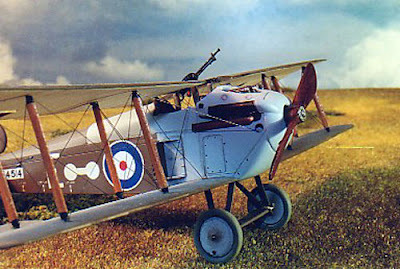 Early aircraft were often fitted with improvised crash pylons consisting of steel tubes over the cockpit to protect the pilot's head. Operational usage eventually showed that fears of pilot injury from overturning were largely unfounded. Crash pylons thereafter disappeared from front line aircraft, though they were often retained on training aircraft. Night-flying Dolphins of No. 141 Squadron, a Home Defence unit, had metal loops fitted above the inner set of interplane struts. Despite early problems, the Dolphin eventually proved successful and generally popular with pilots. The aircraft was fast, maneuverable, and easy to fly, though a sharp stall was noted. When functioning properly, the Hispano-Suiza afforded the Dolphin excellent performance at high altitude. Accordingly, the Dolphin was often deployed against German reconnaissance aircraft such as the Rumpler C.VII, which routinely operated at altitudes above 20,000 ft. No. 87 Squadron explored the use of equipment to supply pilots with oxygen at high altitude, but the experiment was abandoned after trials showed that the oxygen tanks exploded when struck by gunfire. The highest-scoring Dolphin unit was No. 87 Squadron, which shot down 89 enemy aircraft in the type. Pilots of No. 79 Squadron shot down 64 enemy aircraft in the eight and one half months that the aircraft was at the front. The top two Dolphin aces served in No. 79 Squadron. Captain Francis W. Gillet, an American, scored 20 victories in the type. Lieutenant Ronald Bannerman, a New Zealander, scored 17 victories. The third-ranking Dolphin ace was Captain Arthur Vigers of No. 87 Squadron, who attained all 14 of his victories while flying the same aircraft. Another notable ace, Major Albert Desbrisay Carter of No. 19 Squadron, obtained approximately 13 of his 29 confirmed victories in the Dolphin. Captain Henry Biziou scored eight victories in the type. Four Royal Air Force squadrons operated the Dolphin as their primary equipment, while other squadrons used it in small numbers. No. 1 (Fighter) Squadron, a Canadian Air Force unit, formed with Dolphins at RAF Upper Heyford. The unit became operational shortly after the Armistice. In October 1918, the American Expeditionary Force purchased five standard Mk Is for evaluation, sending four back to the United States. 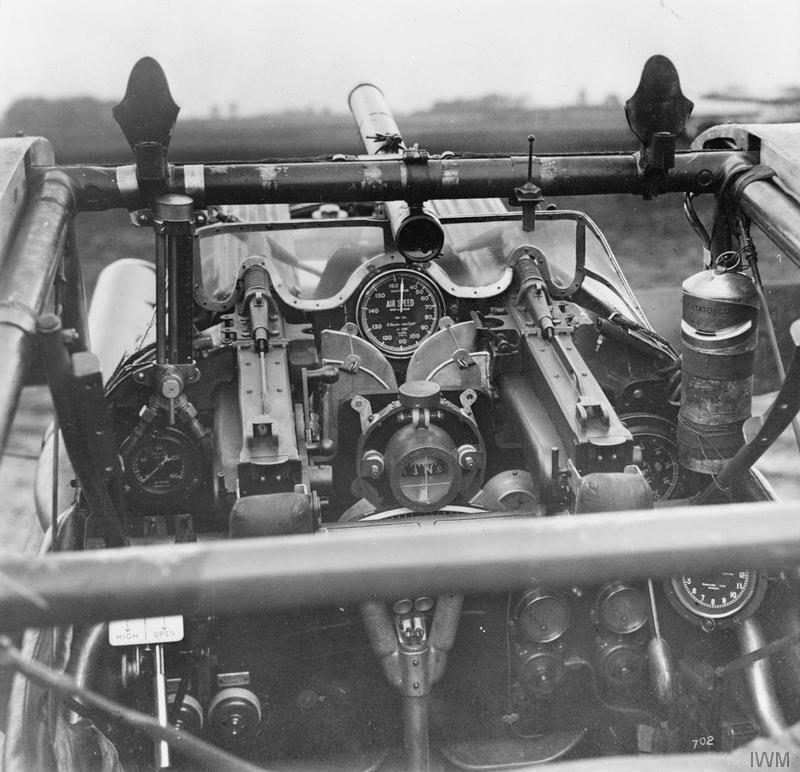 The scarcity and unreliability of the French-built Hispano-Suiza 8B engine proved to be the most serious problem in the deployment and use of the Dolphin. Use of insufficiently hardened metal in the pinion gears led to numerous failures of the reduction gearing, particularly in engines built by the French firm Brasier. The engine also suffered persistent lubrication problems. Limited production capacity for the Hispano-Suiza engine, and the priority afforded to French aircraft like the SPAD S.XIII slowed Dolphin deliveries. Availability of the Hispano-Suiza improved in early 1918 as the French firm Emile Mayen began deliveries on an order placed by the British Admiralty. The official armament of the Dolphin was two fixed, synchronized Vickers machine guns and two Lewis guns mounted on the forward cabane crossbar, firing at an upward angle to avoid the propeller disc. The mounting provided three positions in elevation and limited sideways movement. In service, however, the Lewis guns proved unpopular, as they were difficult to aim and tended to swing into the pilot's face. Pilots also feared that the gun butts would inflict serious head injuries in the event of a crash. Most pilots therefore discarded the Lewis guns, though a minority retained one or both guns specifically for attacking high altitude reconnaissance aircraft from below. Pilots of No. 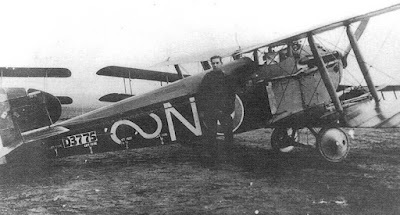 87 Squadron, including Arthur Vigers, experimentally fitted some aircraft with two forward firing, unsynchronized Lewis guns mounted on top of the lower wing, just inboard of the inner wing struts. These guns could fire incendiary ammunition, which could not be used with the synchronized Vickers guns. However, the 97-round ammunition drums could not be changed once empty, nor could the pilot clear gun jams. This field modification did not become standard. Dolphins were quickly retired after the war. Nos. 19 and 87 Squadrons demobilized in February 1919, followed by No. 23 Squadron in March. The last RAF unit to operate Dolphins was No. 79 Squadron, based at Bickendorf, Germany, as part of the army of occupation. The squadron demobilized in July 1919. The Dolphin was declared obsolete on 1 September 1921. No. 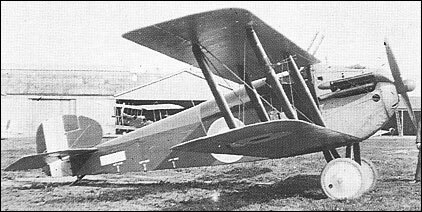 1 (Fighter) Squadron of the Canadian Air Force, which operated Dolphins and S.E.5as, Sopwith Snipes and captured Fokker D.VIIs, was disbanded on 28 January 1920. Although retired from Canadian Air Force service, a small number of Dolphins were sent back to Canada. One Dolphin was converted for civilian use. In 1920, Handley Page Ltd. obtained D5369 and operated it as a demonstrator under the civil registration G-EATC. This aircraft was sold in 1923. The Polish Air Force operated 10 Dolphins during the Polish-Soviet War. From August 1920, these aircraft were primarily used for ground attack duties in the Battle of Warsaw and other actions. They were soon grounded due to lack of spare parts. A total of 2,072 Dolphin Mk I aircraft were produced by Sopwith, Darracq Motor Engineering Co. and Hooper & Co. Approximately 1,500 Dolphins were stored awaiting engines at the time of the Armistice. These incomplete airframes were eventually scrapped. Two developments of the Dolphin were planned. The French firm SACA (Société Anonyme des Constructions Aéronautiques) commenced licensed production of the Dolphin Mk II in 1918. The RAF expressed no interest in this variant, which was intended for the French Aéronautique Militaire and the US Army Air Service. The Mk II's 300 hp direct-drive Hispano-Suiza 8F gave a maximum speed of 225 km/h (140 mph) and a ceiling of 8,047 m (24,600 ft). 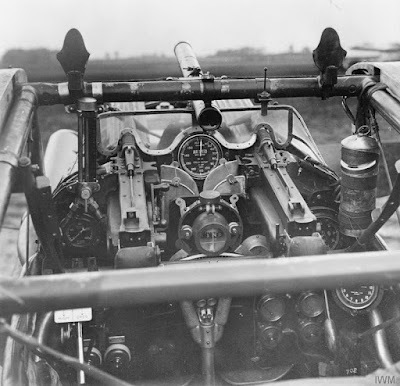 The new engine had a displacement of 18.5 litres (1,129 in3) and required an enlarged, bulbous cowling that fully enclosed the guns. The Mk II also featured an additional fuel tank, a variable incidence tailplane, strengthened airframe and longer exhaust pipes. 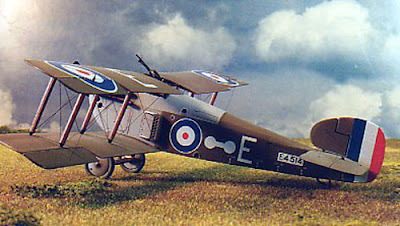 The Air Service anticipated delivery of over 2,000 Mk II aircraft by the summer of 1919, but only a few were delivered before the Armistice.